How many dancers does it take to screw in a light bulb? What should I wear for Belly Dancing class? You should come in stretchy, form fitting clothes that are easy to move in, no shoes necessary. You do not need a partner to take dance classes or to go dancing. Both couples and singles are welcome. We rotate partners in our group classes. At the dances you can dance with anybody in the room. That is part of the fun! Do I need dance experience? No experience needed! Most people who start social dance classes have NO dance experience at all. Dance classes are casual. Some evening dances are dressier than others but most are casual. Saturday night Ballroom dances and Sunday night Milongas are at least a step up from casual. Some people also like to dress up for live bands. Wear shoes that don’t fall off. Group classes are $18 each. What a lot of people do though is buy our “Virtual” Punch Cards. We have 5 group classes for $75 (just $15 a class! ), 10 group classes for $140 (just $14 a class! ), and 20 group classes for $240 (just $12 a class!). None of these expire, and you can them use for ANY class at ATOMIC Ballroom. We also offer an Unlimited VIP Membership for $89 on your first month and a recurring charge of $159 each month following. If you take 4 classes a week, each class comes to only $10! Private lesson prices vary depending on the package that is right for your goals. Best see us in person or call us at 949.250.3332. Evening dances are $5 on Mon, $8 on Tues, $7 on Wed, $8 on Thurs, $10 on Fri, $10 on Sat, $10 on Sun. What if I have 2 left feet? “2 left feet” is a curable disease. It’s really just about recognizing weight changes. Typically, people who think they have 2 left feet become rather good dancers because they work harder. It’s the people that think they are naturally talented that don’t learn quickly. You’ve seen American Idol right? No. However it’s a very good idea to rotate partners even if you have one. The short reason is that you don’t want to get used to each other’s bad habits. 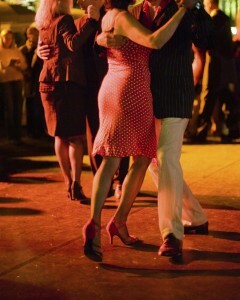 Social dancing is very much about adjusting to each person you dance with. However at the end of the day, it’s up to you. It’s very common for couples to try not rotating. Often they find they have more fun involving themselves with the class. Read this blog entry for more. What’s the best way to get introduced to partner dancing? Try our New Student Special! A 10 Group Class Virtual Punch Card for $70 per person. That’s 50% off the normal price! Our New Student Special can only be purchased on your first visit. Buy this in person when you arrive. No reservation needed!